We're proud to announce that you can now add Telegram channels, giving you access to a super-fast, simple and free platform used by over 62 million people around the world through any mobile device. Telegram is a cloud-based instant messaging service - similar to WhatsApp and WeChat - with a focus on speed, openness and security. It's open source and encrypted end-to-end, meaning that all data sent and received via Telegram cannot be deciphered when intercepted by your ISP, network administrator or other third parties. 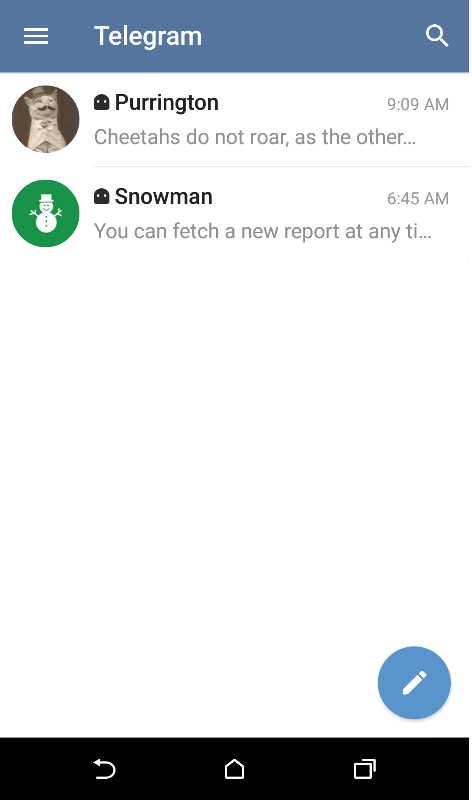 Much like TextIt, Telegram Bots allow you to create custom tools that provide you with alerts, weather forecasts, translations, or other services upon request, e.g. Poll bot. As it stands, Telegram doesn't provide a method for sending bulk messages or notifications. In fact, a Bot not connected to TextIt can't initiate conversations with new users. 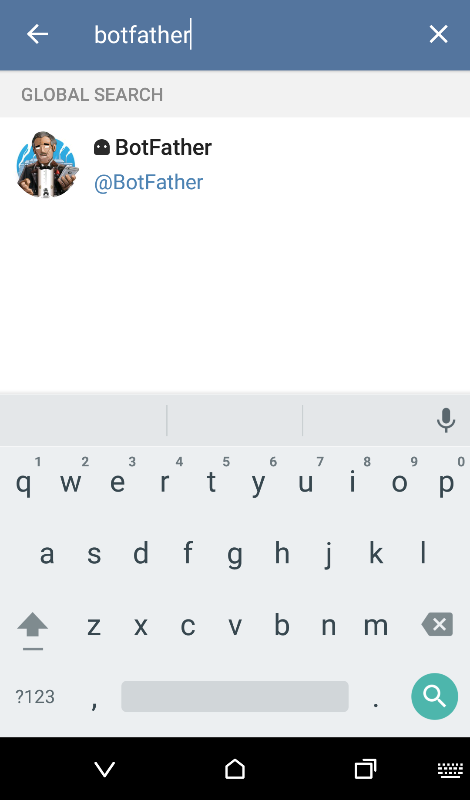 A new user must either add them to a group or send them a message first (they can use telegram.me/<bot_username> links or username search to find your bot). 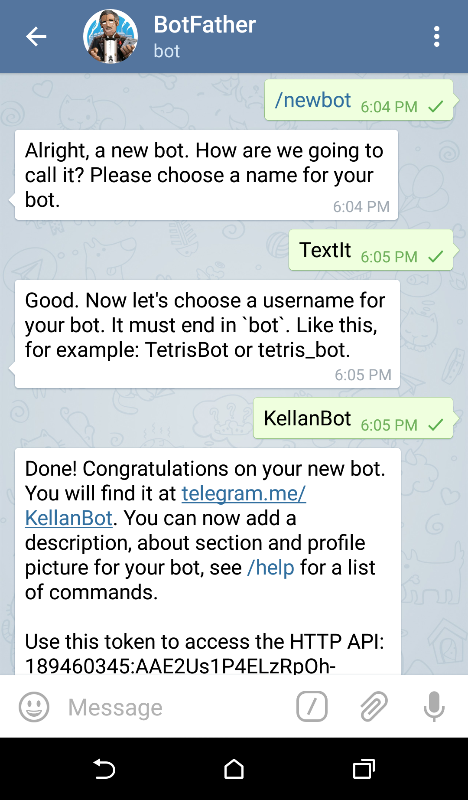 However, when a Bot is connected to your TextIt account, your Telegram contacts become TextIt contacts, allowing you to leverage our broadcast functionality to initiate conversations and send bulk notifications with ease. 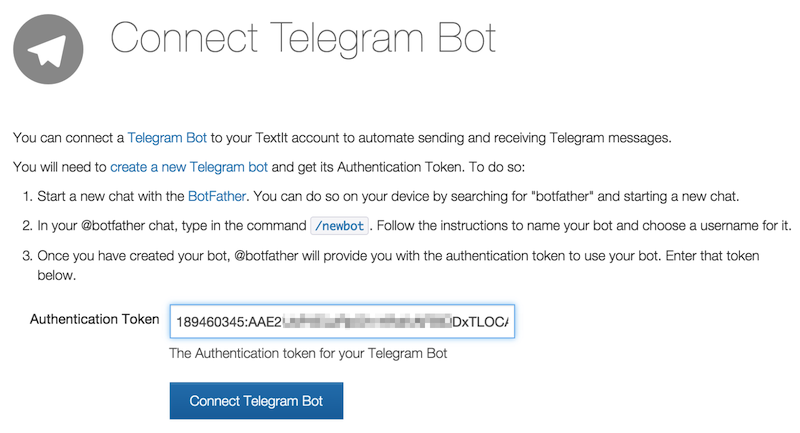 You'll be asked to enter an authentication token from your Telegram Bot, which is provided after you create it in Telegram. After initiating the conversation, send the /newbot command and give your bot a name. You can follow the link provided to give your Bot a picture and description. Then, plug the authentication token you're provided into your TextIt account. Each time a new end-user initiates a conversation with your Bot, they'll do so by tapping or typing the /start command*. You can assign an introductory workflow, e.g. a registration workflow, to your Bot by creating a keyword trigger. *In order for your contacts to receive messages from your TextIt account via Telegram, they'll first need to tap the /start command. As always, if you have any questions, comments or suggestions, let us know! If you don't yet have a TextIt account, you can create one for free here. We provide 1,000 complimentary messages to help you get started.